Guardian caption: Large numbers’ would support a far-right party, if it was not linked to violence. 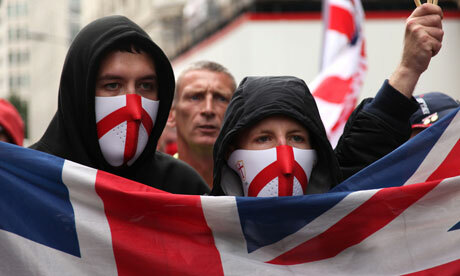 A poll sponsored by the far-left magazine Searchlight has found that nearly half of the voters of England would support “an anti-immigration English nationalist party if it was not associated with violence and fascist imagery.” (“Searchlight poll finds huge support for far right ‘if they gave up violence’“) Of course the idea that either the BNP or the English Defense League (pictured above) advocate violence is a creation of the media and the left. And since when is the Cross of St. George fascist imagery? But the good news is that the English are waking up. Indeed, the Daily Mail article noted that 39 per cent preferred to call themselves English rather than British. Left-wing Labour MP Jon Cruddas said there was ‘very real threat of a new potent political constituency built around an assertive English nationalism’. 48% said they would support a party that ‘wants to defend the English, create an English parliament, control immigration and challenge Islamic extremism’. ‘They would also restrict the building of mosques and order the flag of St George or the Union Jack be flown on all public buildings’. Of course the response of the left is to begin yet another PR campaign on the infinite value of immigration and a non-White England. The Searchlight’s Together project will “tackle extremism among white and Islamic -communities with the slogan: ‘A plague on both their houses’.” I will not comment on the use of the word ‘extremism’ for people who simply want to defend themselves and their way of life. Despite the media campaign to associate a White ethnic identity and anti-immigration sentiment with “extremism,” violence, and fascism, the results confirm the view that political parties that combine anti-immigration appeals phrased within the boundaries of post-WWII rhetoric on race can be very successful in Europe (see The Wilders Syndrome: Jews, Israel, and the European Right). The results may go even further to suggest that messages framed in terms of English nationalism would have broad appeal. Right. And not a moment too soon.